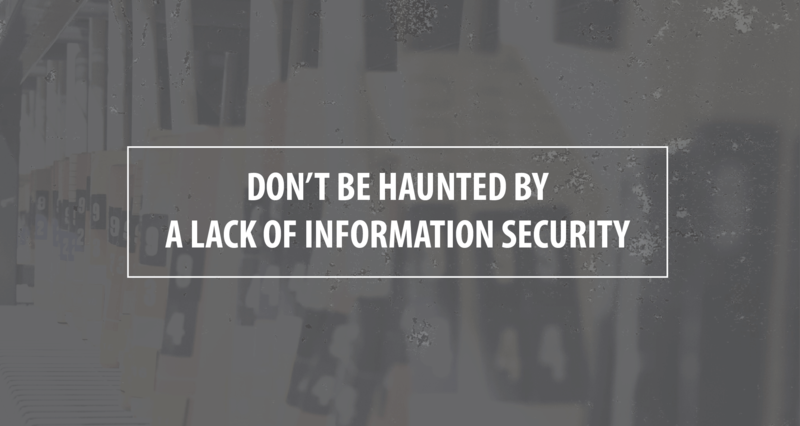 ﻿ Don’t Be Haunted by a Lack of Information Security - Augusta Data Storage, Inc. In today’s business environment it’s easy to forget the importance of information security for your hard-copy records. There are many systems and processes you can put into place to protect digital information; but loss, theft and misuse of paper records still remains one of the top causes of information security breaches. So, in the spirit of Halloween, we’re sharing ways to make sure that your information security is full of all treats and no tricks. One of the best ways to promote information security is to outline the steps you expect your employees and staff to take to protect your paper records. This includes defining what information should be protected, how to protect and store information while it’s in use, and how to safely dispose of it. Need some help getting started? Check out these 5 Tips for Establishing Document Policies. Once you have established how to manage and maintain the security of your active records, consider implementing some best practices to help ensure that records are not misplaced or left unsecured prior to final destruction. Regularly check in with reminders and tips to help keep your policies top of mind, and consider promoting a clean desk policy to help encourage your employees to file records away after using them and to lock away proprietary and personally identifiable information. Planning ahead for information destruction is one of the biggest ways you can protect your hard-copy assets. Once you develop your document policies, plan for regular shredding service or annual purges to ensure that no information is sitting in storage longer than it needs to be. When you work with a NAID AAA certified secure shredding partner, like Augusta Data Storage, you can rest assured that your document destruction process is both efficient and compliant. From weekly scheduled shred pick-ups to large-scale purges, our team of trained and certified staff are equipped with the tools and knowledge to ensure that your records are securely destroyed. If you’re wondering why ignoring your information security processes might come back to haunt you, check out this summary of the cost of a data breach, based on 2017 data of information security breaches.